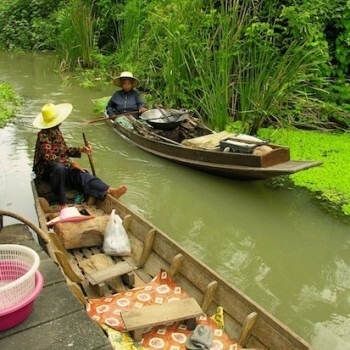 With its peaceful rural atmosphere, proud tradition of local foods, enchanting canal-side villages and floating markets that don’t happen merely for tourism, a visit to Samut Songkhram province is like taking a step back in time. Join us for this day trip to see, taste and experience the best of old style Thailand. The Amphawa & Tha Kha Floating Markets tour is perfect for anyone hoping to experience a real Thai floating market in all its colorful glory. 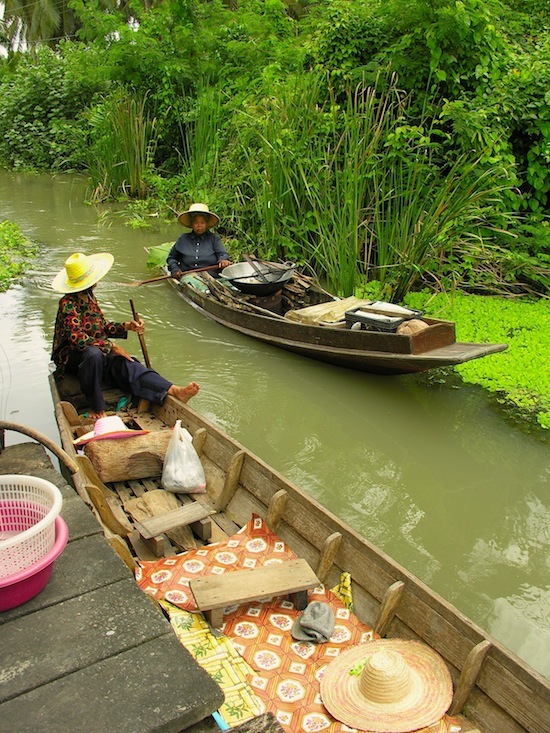 This tour is also an opportunity to soak in the simple beauty of Thai village life along the canals — with some surprises thrown in. Click here for photos of this tour. 8:00: Meet at Wutthakat BTS SkyTrain Station, Exit 2. (Pick up at your hotel is also available). We’ll then embark on the hour drive to Samut Songkhram province; on the way, we’ll stop to see a working salt farm in an area famous for its briny sea salt (when in season). 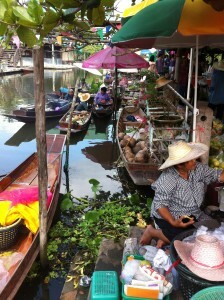 9:00: Arrive at Tha Kha, one of the last traditional floating markets left in Thailand. Just as they’ve done for centuries, the area’s framers row wooden sampans to the market on weekends and certain moon cycle days to trade in the area’s impressive array of produce. At the market, we’ll chat with the locals and taste some of the Thai finger foods, noodles and fruits that this area is known for. 11:00: Take a ride on a long wooden rowboat paddled by a local. You’ll cruise beneath tropical foliage that hangs over the canal, passing century-old wooden houses and spooky spirit shrines. Halfway through, we’ll hop out to explore a coconut farm, eat fresh coconuts and watch as the farmers produce coconut sugar from the sap of the coconut trees. 12:30 – 13:30: Enjoy a local mackerel fish specialty in Bang Noi, another charming village nestled along the Mae Khlong River. You can also get a Thai massage while here. 13:45: Reach Amphawa and stroll beside the UNESCO-awarded teak wood houses that dot the canal. 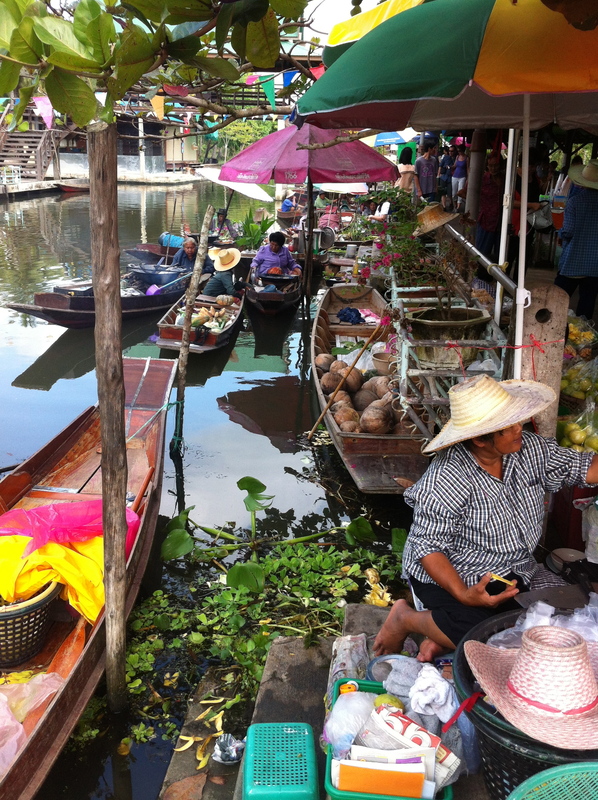 We’ll also explore the markets — both floating and on land — while leaving room for you to shop and sample the abundant local foods. 16:00: Return to the SkyTrain in Bangkok. These times are estimates, and we don’t normally stick to a rigid schedule unless the customer requests to be back at a certain time. There may even be time for an extra surprise or two. *Food samples are subject to changes/additions and can be adapted to your tastes. Vegetarians and those with allergies are welcome. Saturday, Sunday and occasional weekdays, depending on the moon cycle. 8:00 AM at Wutthakat BTS SkyTrain Station, Exit 2. For a map of the BTS sky train and MRT subway systems, click here. 3,500 Baht per person for groups of 2 or more. 5,000 Baht for 1 person. Half price for children aged 12 and under. Free for babies aged 2 and under. *These prices are for private tours. We do not offer mixed group tours. To reserve a day, please email us directly at chilipastetour@gmail.com. Please check your Spam folder if you don’t hear back from us within 24 hours. What is the date (or range of dates) that you would like to do the tour? If you would like to be covered by our insurance for free, what are the full names, ages and nationalities of every person in your group? Are you okay to meet at the meeting point or would like pick up at your hotel? Any special eating requirements — allergies, vegetarian, no pork, no spicy food, etc.? Food and culture tours in Bangkok, Thailand.